With this insightful and intelligent book, professionals can help institutionalized older adults express themselves creatively. One of only a few books on expressive arts for older people, this unique, new volume is ideal for professionals who provide art activities for residents in adult homes and retirement communities. Creative experience can facilitate the expression of ideas and feelings, increase sensory stimulation, improve self-esteem, and improve social relationships. Creative Arts With Older People provides time-tested suggestions to stimulate the creative process among older adults, resulting in numerous physical, psychological, and social benefits. The author, an artist and a social worker, describes dozens of activities that have proven effective in her many years of working with older people--painting, movement, poetry, sculpting, puppetry, dramatic expression, and more. She explains the goals and advantages of each activity, includes a list of materials needed, and details the step-by-step process for conducting each activity. 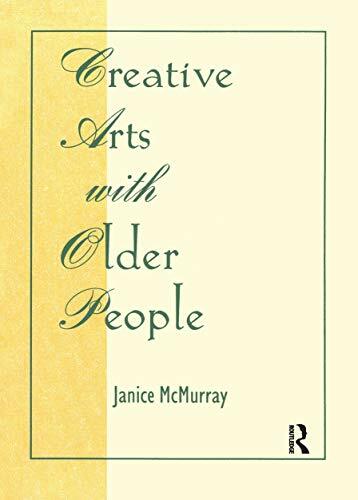 Creative Arts With Older People is a practical and valuable book for activity directors in adult homes and adult health care units, and workers in adult day care centers, adult psychiatric facilities, and senior centers.